The Empire of Fellein is in mourning. The Emperor is dead, and the armies of the empire have grown soft. Merros Dulver, their newly-appointed - and somewhat reluctant - commander, has been tasked with preparing them to fight the most savage enemy the world has yet seen. Meanwhile, a perpetual storm ravages the Blasted Lands, and a new threat is about to arise - the Broken are coming, and with them only Death. An amazing book for adults that are tired of the love concurs all bs. The main character doesn't get his first love in fact he gets sum strange from a random girl. When you finally get to see under their vale it will make your jaw drop. Of course, I think it is a unique and refreshing fantasy series. I ran across the first book in the series by accident and couldn't stop grinning at my rare find. It is just cool and badass! What about David de Vries’s performance did you like? Dave is right on and I find him to be one of the best. Made me happy ;that for once when I tried an unknown, I hit the mark. Read it and spread the word! 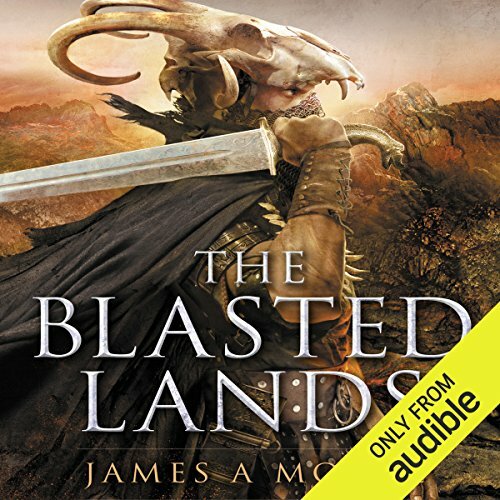 If you could sum up The Blasted Lands in three words, what would they be? I really love this series so my irk isn't due to storytelling but the fact that it is lean in my opinion. There are some questions that should have been answered in this book. Many are now being answered in book 3 and I don't see the reason for the delay. Good book but not enough forward movement. On the plus, I feel the characters are fleshed out more in this book than the first one. I like the accents that he employs. It makes it easier to keep up with who is speaking in the dialogs and his vocal ranger makes the females believable. This is a very well written and thought out books We begin to see motivations of the Sa'ba Taalor and understand their culture more. It is a very inventive society and religious structure. I am listening to this series for a second time and love it even more! Give the 'Seven Forges' books a try...WELL worth the credits! the story itself was interesting. however it felt very over written and by that i mean if he had used the word large to describe someone he later used giant and massive and gargantuan later to describe the same person. also the author seemed to want to get specific ideas across repeatedly to the reader. such as 'they trained to fight from birth' something repeated to the reader, almost as if it were a side note, several times. I truly love this series! The characters are full of depth and flaws that make them believe able. I tell everyone I can about this series to spread the word! Great new fantasy setting! Realistically, if you enjoyed the first you will likely enjoy this book. More time is spent exploring the Blasted Lands than the first (thus the title) and giving us a peek beneath the veils. Worth a listen if you enjoyed the first. The story has improved a bit since the first book. I didn't really get in to the first book. But I had accidently bought this one first, and needed something to listen. To, so I decided to give this one a go. The narrators choice of a scandinavian/Swedish accent for the grey skinned people (note, the story hasn't been engaging enough to make names or pronouns stick) is interesting. I'm a bit weirded out by the reveal of what lies under the veil. Events and motives were partially revealed near the end of this book, which have peaked my interest. I still feel quite confused, however. It seems like there are major details that I'm just missing. Maybe I missed them when my brain checked out in the first book, but it feels more like the author is trying to lure readers in by being cryptic. He shouldn't have been so heavy handed with it. Instead of a burning desire to know more, I just feel annoyed.